The fate of the socialist left is tied to that of the working class movement—and the last four decades of one-sided class war have had dire consequences for both. The thread linking today’s generation of young workers to U.S. labor’s proud history of class struggle has been effectively broken and must be developed anew. This is a daunting but necessary task for rebuilding the working-class movement. The 2007 global financial meltdown was caused by neoliberal policies, yet these remain firmly in place and will continue to remain so until they are pushed back through struggle from below. The role of radicals in this process is no less important today than it was a century ago. Perhaps most important, seven years after the start of the Great Recession the class struggle remains largely subdued. The conditions facing the U.S. working class and the left are therefore quite different than at the parallel stage in the Great Depression of the 1930s, when a strike wave was sweeping the nation. Building revolutionary movements in non-revolutionary periods always carries the twin dangers of sectarian isolation and/or political adaptation. The problem is that very often the left historically has posed the question as if the choice was between these two poles—either adapting to the existing state of mass consciousness or building a revolutionary sect. At present, many on the left have adapted to the so-called “politics of realism” (that is, the Democratic Party as “the lesser of two evils”), accompanied by a knee-jerk hostility toward the organized revolutionary left. But after six years of Obama, the need for political independence from the Democratic Party is even clearer today than it was during Clinton’s presidency. The legacy of the unsuccessful attempts by virtually every tendency on the 1960s left to build revolutionary parties after 1968 weighs heavily on the present. Many on the left have concluded that such efforts at “party building” are necessarily sectarian and fruitless. Thus, the antagonism toward political parties of all types on the part of a whole layer of newly radicalizing people is not solely driven by hatred of the existing bourgeois and reformist parties but also is a result of these past failures. Yet the experience of the struggles that have emerged in this period of social and economic crisis is that the critical missing element in each case was a socialist organization of sufficient size and social weight to influence the outcome. While the mistakes of the 1960s generation should not be repeated, revolutionary organization is exactly what is needed today. Since the economic crisis of 2007, U.S. socialists have been in a political period marked by a high level of volatility that is shaped most importantly by high levels of class inequality and social polarization. The ruling class faces significant economic and political weaknesses and frictions—including the contradictions resulting from the resumption of the United States’ permanent war in the Middle East and deep-seated economic problems that have fueled talk about another recession on the horizon. Nonetheless, the ruling class continues to be on the offensive around a shared agenda of restoring profitability following the 2007-08 recession. The resulting deep and permanent cut in working-class living standards and organization continues to fuel bitterness and anger—and is the main driving factor of the political radicalization of the period. Indeed, seven years after the financial crisis started, the outlook for workers is grimmer than when it began. Union membership stood at a 98-year low in 2013, with just 11.3 percent of workers—and only 6.7 percent of private sector workers—belonging to unions. For most workers in the United States, it still feels like a recession, even though the economy has been in recovery for more than five years according to official measures—while corporate profits long ago recovered their lost ground and began setting new records. Opinion polls show that 71 percent of people say the recession personally impacted them “a lot” or “just some,” and 64 percent say it is still having an impact on them. Some 40 percent of people say someone in their household lost a job in the last five years. Student loans, credit card debt, and the skyrocketing cost of health care—completely left out of the government statistics showing a low rate of inflation—are a burden on working-class families that never seems to relent. Meanwhile, almost all of the increase in national income during the “recovery” has gone to those at the top. Only 22 percent of people say they are satisfied with the state of things in the United States, and more than 70 percent say that the country is headed in the wrong direction. Today, the percentage of people who call themselves part of the lower class stands at 40 percent, up from 25 percent at the start of the economic crisis—a profound indicator of fundamental radicalization in consciousness compared to the era before the recession. But this class anger and radicalization hasn’t automatically translated into a sustained rise in struggle, much less victories for our side. The ruling class has escalated its offensive since the Great Recession began, pushing the working class yet further on the defensive. This is particularly true in regard to union and workplace struggles. With some very important exceptions—including some teachers and groups of low-wage workers who have threatened or used the strike weapon—the level of struggle is especially low at the point of production, where the ruling class offensive has been most aggressive. The Chicago Teachers Union strike of 2012—in which a strike of 26,000 teachers catapulted issues of class inequality, racism, and poverty to the center of politics—was one crucial example of how working-class struggle can begin to redefine the political landscape, but it was also short-lived and has not been not replicated so far. A further factor impacting the level of sustained struggle is the weakness of the left—both the broad left that includes mass liberal, labor, and progressive organizations and movements, as well as the radical and revolutionary left. As a result, some of the basic organizational structures and political practices that even modest struggles require need to be revived and rebuilt. At the same time, though, the social and economic crisis has given rise to struggles on a higher level than before 2008. In the United States, this has included the occupation of the Wisconsin state capitol at the beginning of 2011 and the Occupy Wall Street movement that spread across the country in a matter of weeks in the last few months of 2011—with the Chicago teachers’ strike taking place the fall of 2012. Internationally, the Tunisian and Egyptian revolutions that set off the Arab Spring represented the high points of a revolt against neoliberalism that found expression in a number of countries throughout the Middle East. It is possible at this stage to draw some conclusions about the struggles that have broken out in the United States since the start of the Great Recession. They are significant due to their mass character, but they have also taken place in fits and starts, involving mass outpourings of anger followed by retreat. This makes sense for a working class attempting to rebuild its own organizations after four decades of one-sided class war. In general, the level of struggle has remained low compared to the scale of radicalization in working-class consciousness. But the social pressures of the present era will continue to find their way to the surface. There will be ideological fissures, sudden political eruptions, spontaneous and short-lived rebellions, and longer campaigns and movements that go through ups and downs. It is tempting to view recent struggles as shooting stars across the political landscape that rise and fall quickly with little lasting impact. For those of us on the left, it can be frustrating to see thousands of people brought into political activity only to seemingly disappear after a short spell of intense activity. This can lead to a tendency to dismiss the struggles that do emerge. But to do so is to miss the ways in which these struggles have begun to forge new networks of activists, have transformed the individuals involved, and have left a lasting ideological residue. The emergence of a new consciousness and experience of struggle around racism—which reached its highest level thus far in Ferguson—illustrates this dynamic. With police murders of unarmed Black men a regular occurrence in this country, it was impossible to know where and when a rebellion like Ferguson would erupt; yet it was inevitable that it would. No one would have predicted that an unknown blue-collar suburb of St. Louis would be the site of the most sustained and dramatic protests against police misconduct since the LA Rebellion of 1992. But knowing the specific political and social environment of Ferguson, Missouri, and the backdrop of the national epidemic of police violence, makes it easy to see in retrospect why the anger there was ready to boil over. Just weeks before the shooting of Michael Brown, Eric Garner was murdered by the police in the streets of Staten Island, New York. The response in New York was restrained and timid compared to Ferguson. An institutionalized liberal civil rights leadership, which includes Al Sharpton, serves to contain as well as to channel anger against racism in New York City. But Ferguson lacks any such liberal institution, while its majority Black population experiences near complete disenfranchisement. These are the conditions that created the explosive eruption of struggle in Ferguson. Ferguson shows the volatility of the political period. But it also illustrates other dynamics: the development of new political forces brought to life through the ups and downs of the movements, the way outbursts of struggle can quickly become a lightning rod for multiple issues, and the political questions and developments that outlast those struggles themselves. Ferguson did not emerge out of thin air. We can point to a number of developments over the last several years that have politicized many thousands directly and millions indirectly around questions of racism. First, there was the struggle to stop the execution of Troy Davis in 2011. While this was not a mass movement, it did manage to break through into national consciousness. In New York City, the protests for Troy Davis joined together with the fledgling Occupy movement, helping to radicalize a layer of young activists. Then 2012 saw an increasing number of struggles of family members of victims of police violence fighting for justice for their loved ones. Most of these struggles have remained small and largely isolated, but nonetheless expressed a new determination to fight, while bringing activists and family members together who were able to make initial connections with one another across cities. It is in this context that the movement around Trayvon Martin emerged and took on a national character. There were demonstrations of thousands in cities across the country, and activists in Florida launched civil disobedience actions, while forming new organizations like the Dream Defenders. Thus, well before the rebellion in Ferguson, a general awakening around issues of racism has expressed itself in a higher level of struggle and greater radicalization, bringing new people into political activity and organization. And over the course of these different fights, there has been a rise in their scale, politics, and impact on mass consciousness. Most of these struggles were short-lived and difficult to translate into sustained and generalizable activity. But it is impossible to trace the history of the struggle against racism in the last three years, and the fact that we have seen new rounds of protests in each of them, and not conclude that something new is developing. 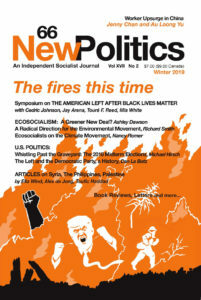 In an article for the Nation written during the Ferguson protests, Mychal Denzl Smith developed a similar analysis in an article headlined “Trayvon Martin’s Death Launched a New Generation of Activism.”3 Smith focused on the rise of new political formations to confront the issue of police violence and racism, and showed how they have a life that continues beyond the specific struggles. While the Dream Defenders receded from ongoing activity, they helped to launch the Black Youth Project and both were part of the mix of formations coming together and interacting with the wave of activity launched by Ferguson. He also described how many of today’s young Black organizers first radicalized around earlier issues of racial injustice such as the Jena 6 and Hurricane Katrina. While we can’t predict the exact trajectory of particular formations, or what new organizations might come together in the coming years, this development is common to the history of many movements. For example, the Southern Christian Leadership Conference was founded in 1957, and the Student Non-violent Coordinating Committee in 1960—when existing organizations proved not up to the challenges thrown up by the rising civil rights movement. When we talk about the weakness of the left and its organizations being a factor holding back the level of struggle, we also understand that the struggles themselves will launch new organizations that can fill the vacuum. The uprising in Ferguson has also highlighted the centrality of racism to other social struggles and movements—particularly to the question of class and class struggle. In both the initial protests and the Ferguson October mobilizations, workers involved in the Fight for 15 were regulars, with their own contingents organized to show solidarity with the struggle against racism. Ferguson has been a galvanizing event for a significant minority of people, particularly African Americans but also more broadly. The tenacity and persistence of the struggle there has made it a focal point and helped give confidence to other struggles—most immediately and directly, the fight in Ohio for justice for John Crawford, who was killed in a Walmart while holding a toy gun in his hand. Just as importantly, if and when these concrete expressions of struggle recede, Ferguson will be a milestone in political consciousness for a significant minority of people—just as we can now see in hindsight that the movement around Trayvon Martin’s murder became. The ideological questions it has raised—about the relationship between racism and capitalism, the failure of the liberal Black political leadership, the reason high levels of racist violence continue under a Black president, the relationship between race and class, and many more—still remain to be answered. All of these developments represent a new fertile ground for the rebuilding of a revolutionary left in the United States—not yet rooted in struggle at the point of production, but nevertheless with the potential to be built within emerging struggles of the oppressed and struggles against inequality inside the working class. But there is nothing easy or automatic about this process. The next major struggle could appear seemingly out of nowhere, like the Wisconsin uprising or Occupy Wall Street, or it might involve the steady building of a strike, as did the Chicago Teachers Union strike of 2012. The question is not whether but when the struggle will resume. This will bring about the possibility for rebuilding the left on a larger scale, but only if the socialist left rises to the occasion. The issue of organization urgently needs to be addressed. This requires training and developing a new generation of young people to the politics and practices of Marxism while constructing the rudiments of organization that fit the present situation. The failure of the party-building efforts of the 1960s and 1970s have little bearing on this process today, and those who participated in those failures should no longer use their own unsuccessful projects to dissuade the organizational efforts of today’s generation of revolutionaries. 1. Helena Smith, “Leftwing Syriza party triumphs in European elections in Greece,” the Guardian (May 25, 2014). 2. Antonis Davanellos, “Greek workers move left,” International Socialist Review (No. 59, May-June 2008). 3. Mychal Denzl Smith, “Trayvon Martin’s Death Launched a New Generation of Activism,” the Nation (September 15, 2014). 4. Kim Moody, “Contextualising Organised Labour in Expansion and Crisis: The Case of the US,” Historical Materialism (Brill, 20.1, 2012), 25. Jennifer Roesch and Sharon Smith are members of the International Socialist Organization. Good analysis, but… Very concisely written piece on where things stand right now. One thing, though, the failure of the party-building efforts in the 1960s and 1970s DO have bearing on today. Of course, those of us who were involved in those efforts should not dissuade today’s generations of revolutionaries, but if today’s generation does not learn from those efforts, they could easily repeat the mistakes that were made. At the same time, there are political and social realities that existed then (and today in different forms) that have even more bearing on the success of revolutionary organizing efforts than any dissuasion from older folks. The ISO has a pretty clear understanding of the role history plays. This piece could be a little clearer about not ignoring it. All in all, though, thanks for putting this out there. It’s time to move! We To the comment: “The failure of the party-building efforts of the 1960s and 1970s have little bearing on this process today, and those who participated in those failures should no longer use their own unsuccessful projects to dissuade the organizational efforts of today’s generation of revolutionaries.” I would add, We also need to look critically at the practices of left activism- including socialist party building, in the 1990s, 2000s, and 2010s. Many groups remain trapped in similar routines, doing the same thing over and over, and remaining relatively small groups. Many have been led by the same leaders for decades- in the far left as well as in the big money, DC-based NGOs- and have not cultivated new leadership nor broken out of their ideologically-imposed isolation. No working class has been as atomized in its social relationships as Americans are today. The business class has probably not ever been as powerful as it is now- and even in the Gilded Age it faced more working class opposition. The long term threat capitalism is posing to the health of our planet is far more permanent and devastating than any 19th century war pondered by Marx or Lenin. We are going to have to be incredibly creative to made a dent against any of this. agreed Yes, I agree with this comment completely. The so-called “organized revolutionary left” seems to blame a lot of its issues and failure to attract and retain active members on events that occurred long ago. In reality, these groups put radicalizing young people off like crazy. They always seem to be talking to themselves rather than doing any real organizing. The only “organizing” they do is self-education and occasionally dropping in on campaigns that other groups have actually organized and making ham handed attempts to “win people over.” They seem totally unaware of how badly they’re regarded by people who do actual organizing. We can locate so many errors in the past, but until we recognize just how lethargic, uninspired, and insular current socialist groups are, we’re not getting anywhere. It’ll just be hobbyists and crotchety old dudes in a few years if there aren’t serious changes. The Recession and now! Since the Recession started we were promised that we go to school and get two years and everything would be o.k. It wasn’t it was a big lie like the Health Care that we’re solved down our throats when we requested “Single Payer Health” and what we got Managed Health with Fines if we didn’t adhere. I’m now retired on a small Social Security Pension that is half then what I was get paid working. After one year of Automotive training at Clackamas Community College 2009-2010 and went out to look for work -“No work in my Craft”. An now the President is using the same rheortic about education. “What a big lie”.